Medical barcodes generator software is highest standard solution to make most versatile and sparkling medical industry barcode images in different colors and looks. Expertise barcode ribbon building application creates good looking healthcare barcode logos with facility to import designed images in many Windows programs like word, excel, paint etc. Excellent barcode image maker program is complete solution to print and scan high quality and classic pharmaceuticals barcode stickers using latest barcode label printer and scanner in effective ways. Download medical barcodes generator software is successfully used by variety of organizations such as medical industry, healthcare, postal services, retails, banking sectors, real estate, pharmaceuticals, telecom sectors, transportations, manufacturing firms, government agencies, shipping, airlines, patient billing etc. 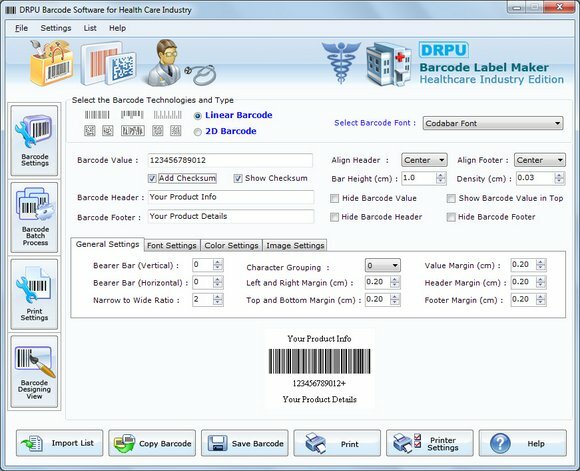 Freeware barcode sticker producer utility is specially designed to update size, positions, dimensions, shapes, caption, colors, fonts, height etc of created high resolution healthcare barcode labels in simplified approach. Reliable barcode label maker application facilitates advanced printing solution to print customized and rich quality medical industry barcode ribbon on single paper in real time. Affordable medical barcodes generator software is capable to save produced printable and colorful pharmaceuticals barcode coupons in many image file formats including jpeg, jpg, tiff, gif, png, emf etc. * Barcode tag creator program has attractive 2D and linear barcode font standards to make precious and own style healthcare barcode logos. * Barcode ribbon building utility offers text, picture, line, circle, pencil, rectangle, ellipse etc designing objects to create flexible stickers. * Barcode image maker tool produces industry standard tags in many shapes and fonts. * Medical barcodes generator software provides attractive graphical interface. iMagic Inventory Software - Managing stock has never been as easy! iMagic Inventory lets you take full control of your inventory and invoicing. Save time, manage customers and get one step ahead of your competition with this inventory software. PrecisionID QR-Code Barcode Fonts - PrecisionID QR Code Font Software simplifies generation of AIM QR Code 2005 and ISO/IEC 18004:2006 and GS1 QR-Code barcodes. The Download Demo zip file includes examples for Crystal Reports, Microsoft Access, Word and Excel. Retail Man POS - Retail Man POS, powerful point of Sale and inventory software. International setup, easy to use. Support for most POS hardware :- docket printer, bar code scanner, cash drawer, pole display, touch screen, scales. Multi-user, multi-store, web store. SmartVizor Variable Data Batch Publishing Software - An advanced,stand alone,powerful and extremely easy to use printing tool that allows you to create templates with variable data by using a large variety of databases for Variable Data Batch Publishing Software. AnyMP4 PDF Converter for Mac - AnyMP4 PDF Converter for Mac can help you convert PDF to document files such as Word, Text, Excel, EPUB, HTML and more, as well as various images like JPEG, PNG, GIF, TIFF and so on for Mac. WTM Copy Protection / CD Protect - Need a good copy protection measure? Worried about piracy? WTM CD Protect - Protect your software against illegal copy. More profit with less illegal copies. BarCodeWiz UPC EAN Barcode Fonts - Print UPC and EAN barcodes from any program supporting TrueType fonts. Create UPC and EAN barcodes in Microsoft Excel and MS Word using BarCodeWiz Toolbar with a click of a button. Easy Gift Card - Described as a full featured solution in a box. Get your software, a start up supply of cards and card reader. Be up and selling in days not weeks. Handy Library Manager - Handy Library Software for Windows. Library database system for small private, public, or corporate libraries. Our library software helps you to catalog library items, organize member information, and keep track of the circulation data.